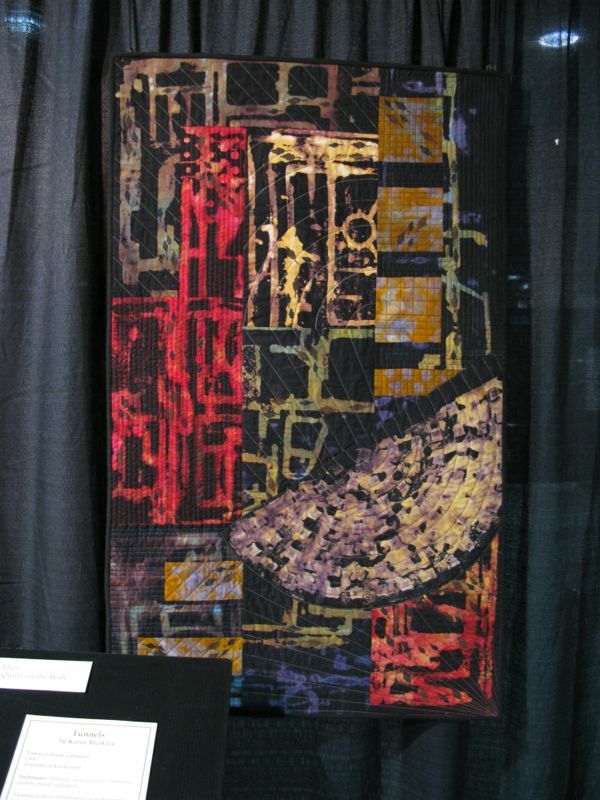 Posted on August 12, 2013 by Elizabeth E.
The Four-in-Art group has chosen Urban as our overarching theme for this next year of quilts. 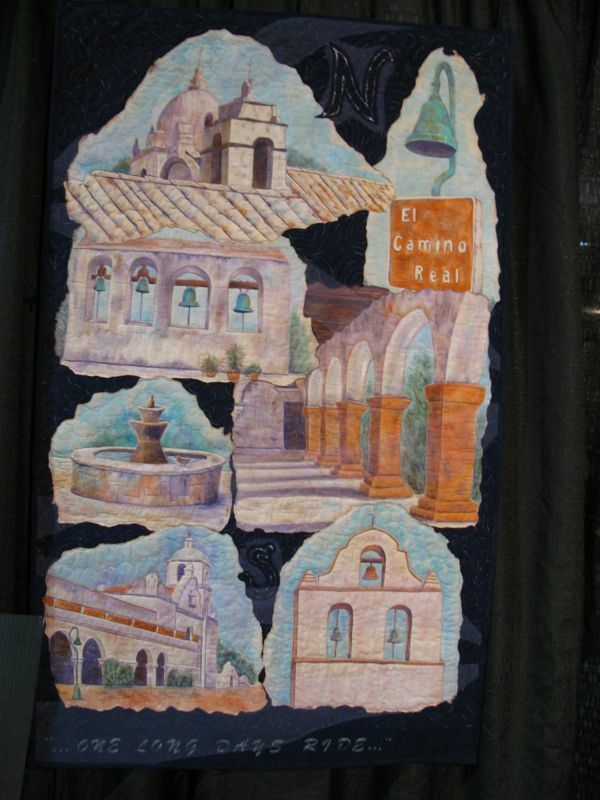 We will reveal quilts on the first of November in 2013, and February, May and August of 2014. 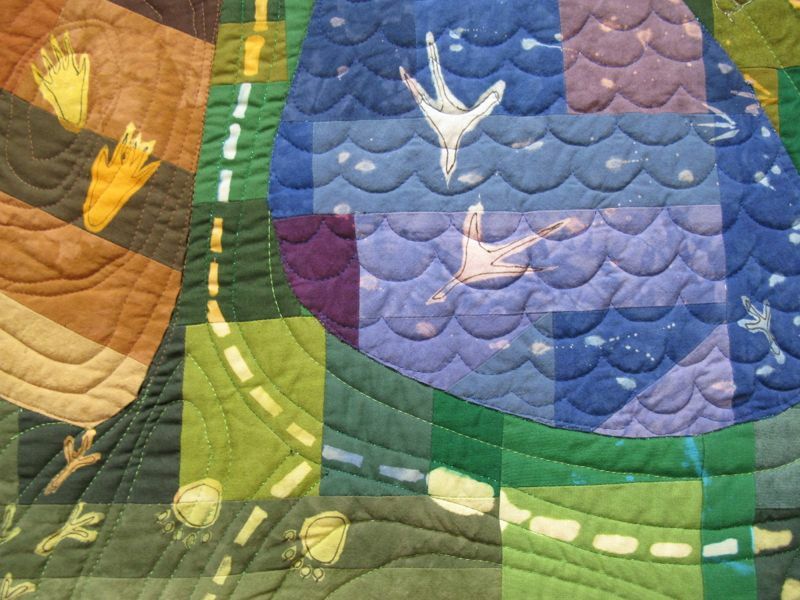 Some map quilts might be literal, as in the renditions above, from a garden to a quilt paying homage to traditional compass symbols. 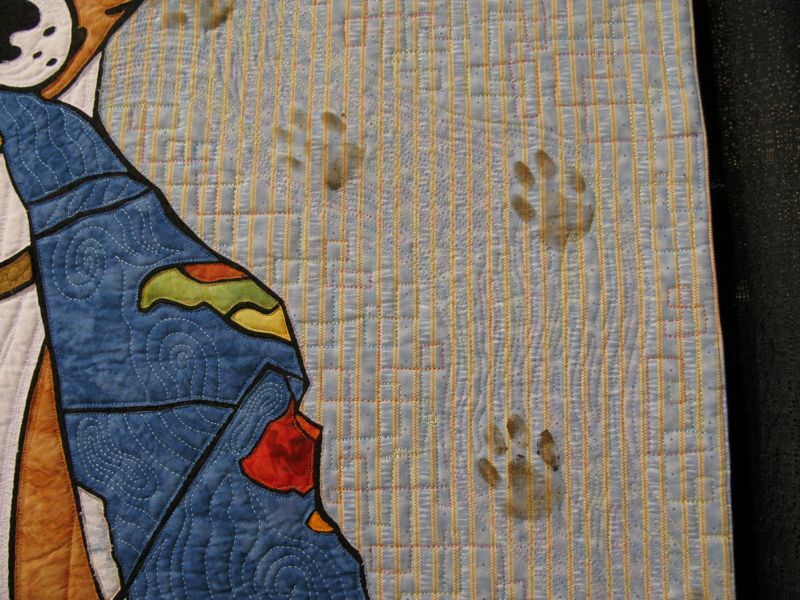 Other map quilts might show traditional maps, like the one above, but reveal pieces of the heart, like when Bisagna was evacuated from her home during a run of California wildfires. She searched aerial photos, trying to discover any news about her house. And through one of these photos, she realized that her “house was indeed gone,” as she wrote in her artist’s statement. 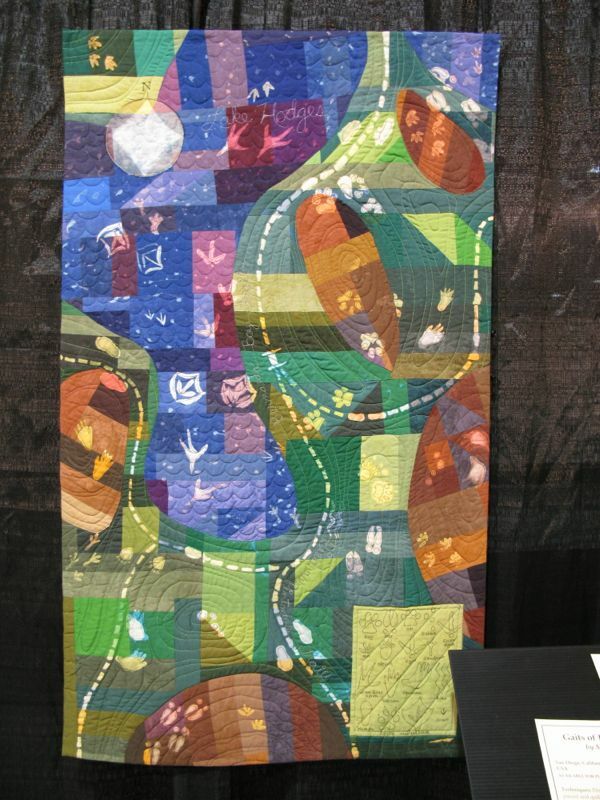 Tour de Apple Valley, by Carolyn Villars depicts a 50-mile race completed by her daughter-in-law, the map in the background showing the route taken. 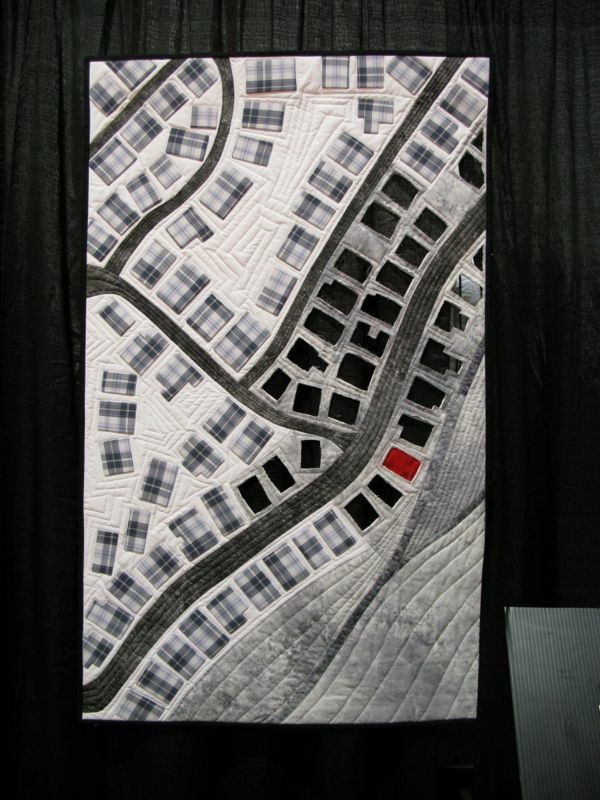 Linda Anderson created this exquisite map of the “Mother Road,” or Route 66 in her quilt One Man’s Dream. 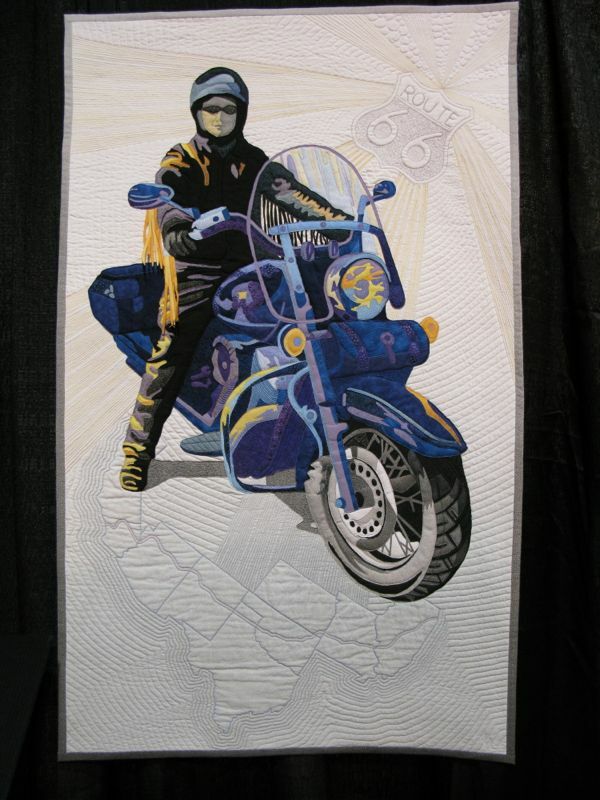 While I couldn’t discover from her statement whether or not her husband had actually traveled the road, I think the bas relief of the white quilting is effective not only as a map, but also as a background for the motorcycling figure. 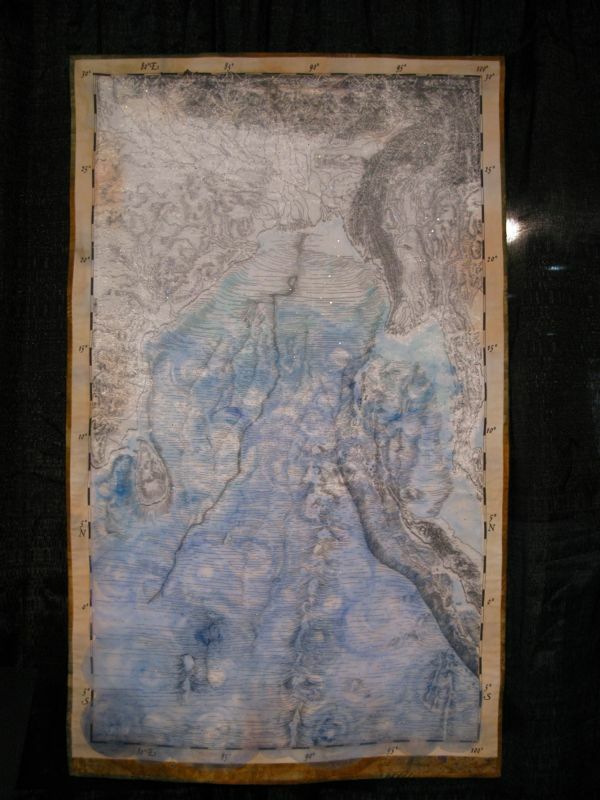 “This quilt (Ice Core) was inspired by ice cores that are used to map climate change” wrote Annette Guerrero, the maker. 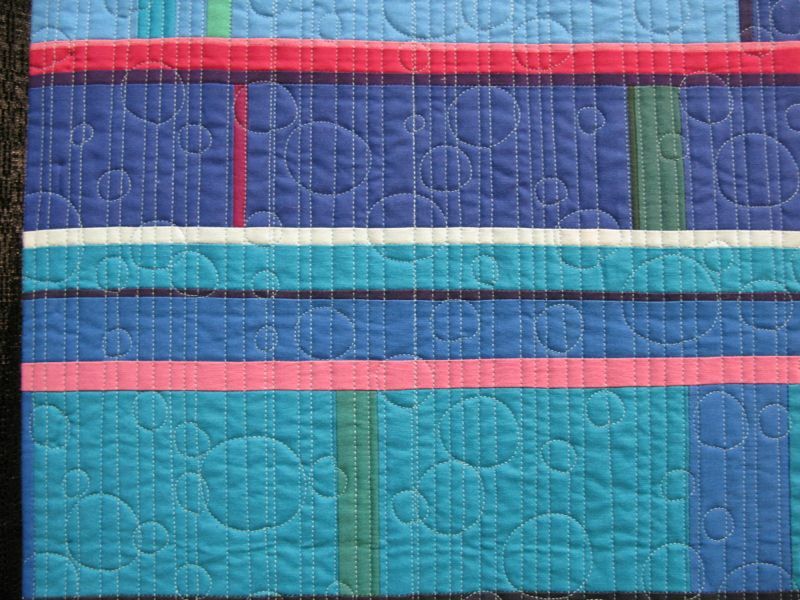 I loved the secondary layer of quilting over the color bands. 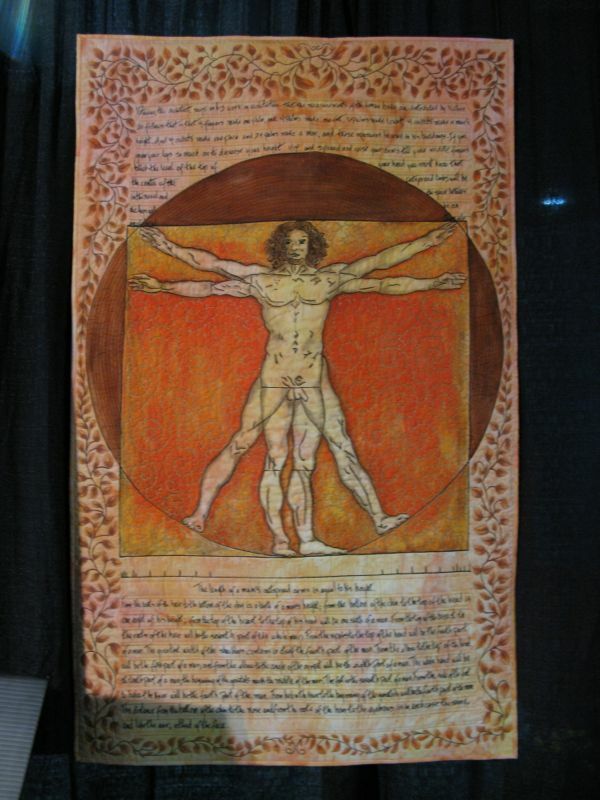 Body Map in Honor of DaVinci’s Vetruvian Man, by Linda Friedman, pays homage to the classic map of the human form by Leonardo Da Vinci. I loved this rendition by Patricia Charity of the romantic era of travel, of steamships and steam trains and great adventures. She titled it It’s the Journey, for in those days, getting from point A to point B was a huge part of travel. 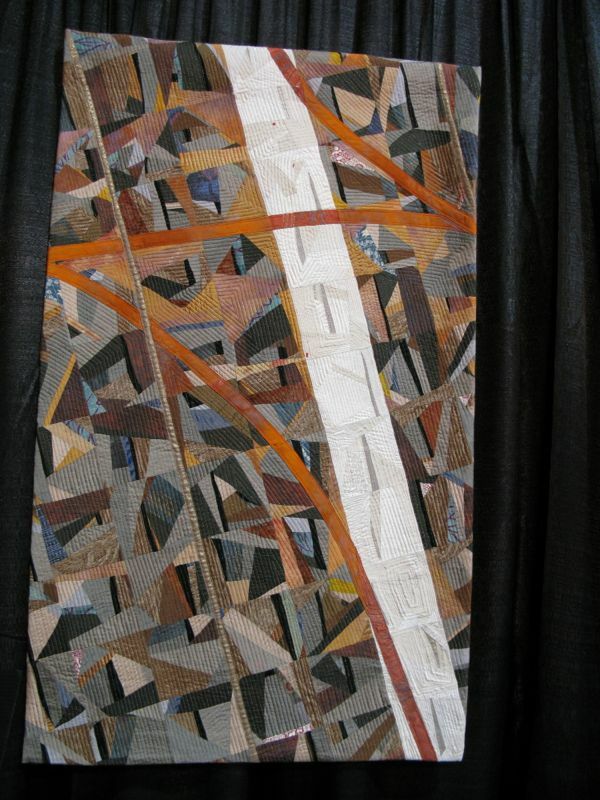 Karen Markley wanted to make a map of subterranean tunnels, such as those that contain subways, water and electrical lines, in her quilt titled Tunnels. 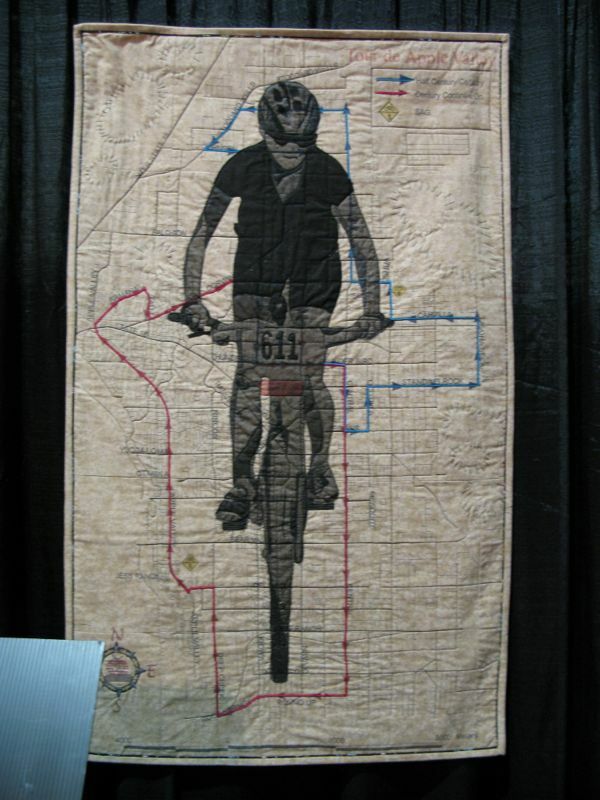 This quilt is less representative and more evocative of what a person might find under their feet. 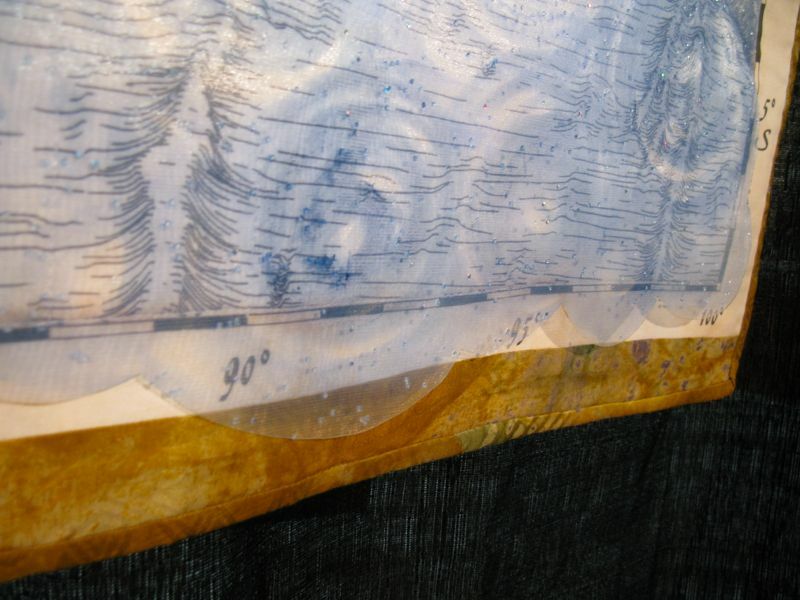 Beth Shibley’s Finding North is a rendition of a “modern compass,” and includes bits of maps that her husband used while hiking the Pacific Crest Trail. 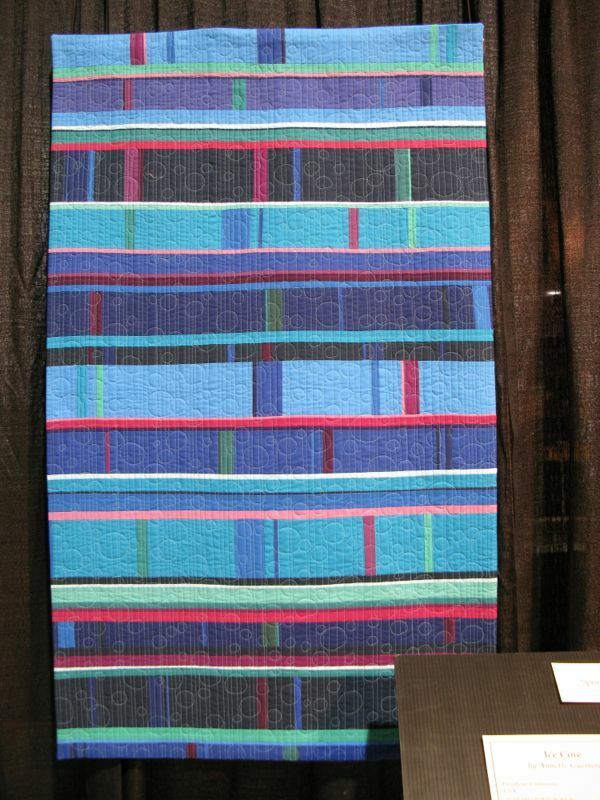 Somewhere Between Science and Fantasy, a quilt by Jo Griffith had a chifffon overlayer on a drawn, or printed, background. Two closeups are below. Bit Map, by David Charity. All the puns you need. Close up below. 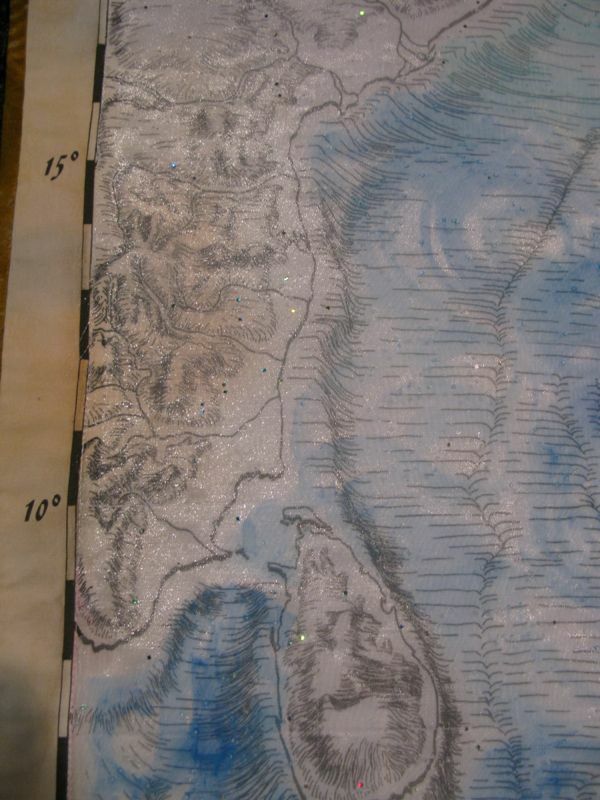 Not only is this a map of a lake, but also the “gaits” of the critters who frequent there. 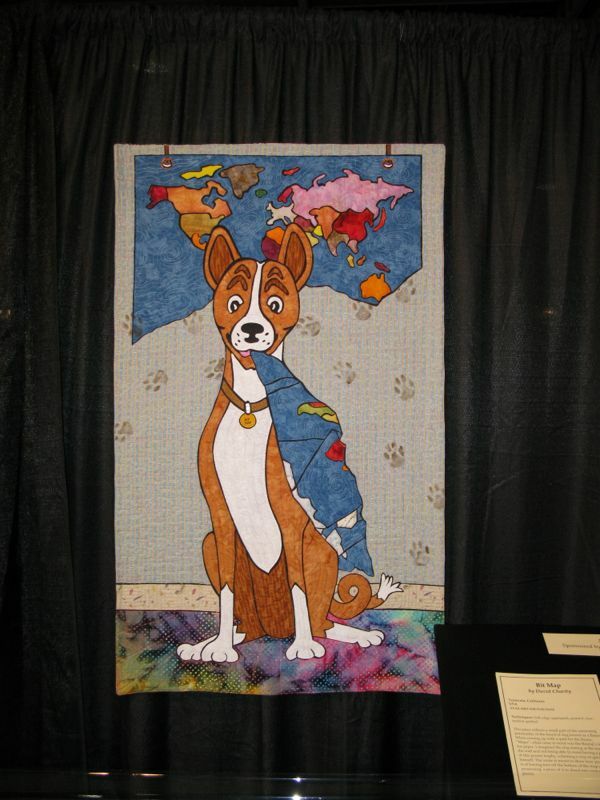 I look forward to our group’s challenge quilt, coming this November. Oh my, what wonderful inspiration! I better put my thinking cap on! Thanks for sharing! What a wonderful year this will be! 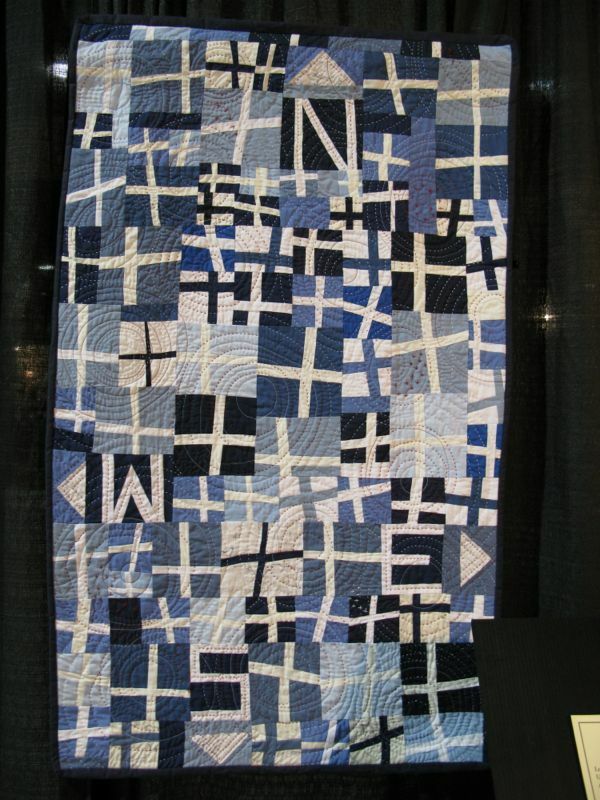 I immediately thought of all those Mariner’s Compass blocks I’ve made! I love ‘taking the back roads’ for its simplicity though! And “Gone” with its rogue red square! Looking forward to seeing the interpretations of these! How timely! And what wonderful interpretations! This is going to be so much fun! They are all beautiful, thank you for sharing them. Thanks for sharing these Elizabeth. 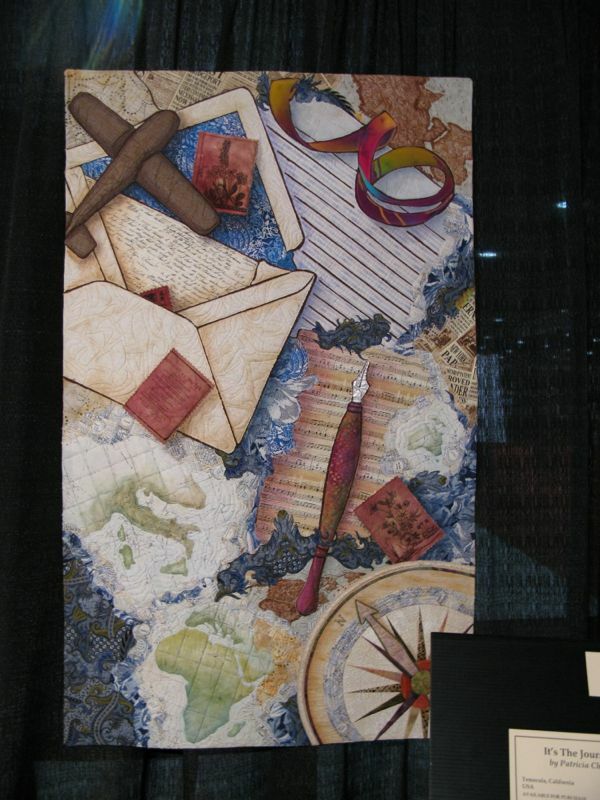 You’ve provided us all with plenty of inspiration on the various ways the idea of “maps” can be interpreted. A great way to start off my journey with your group! What fun….thank you for sharing. 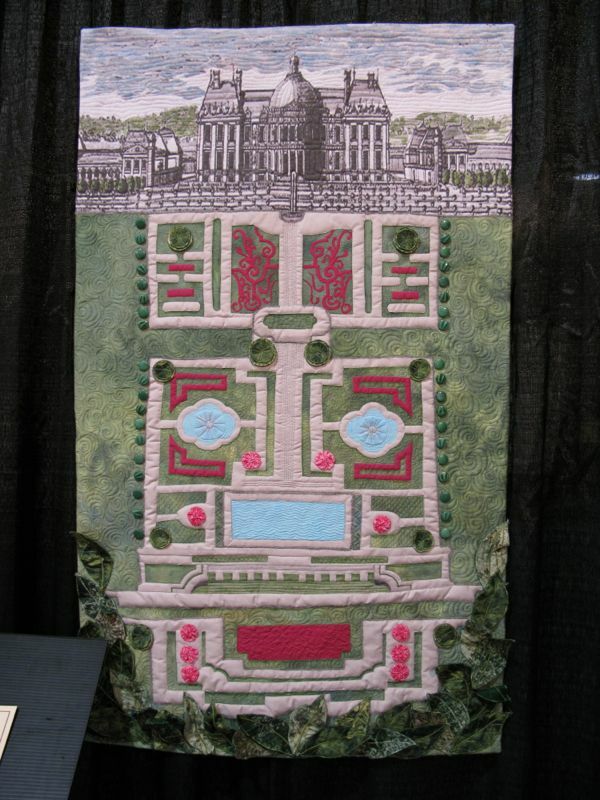 Creativity abounds in the mind of a quilter!! BTW, did we decide on a size limit? 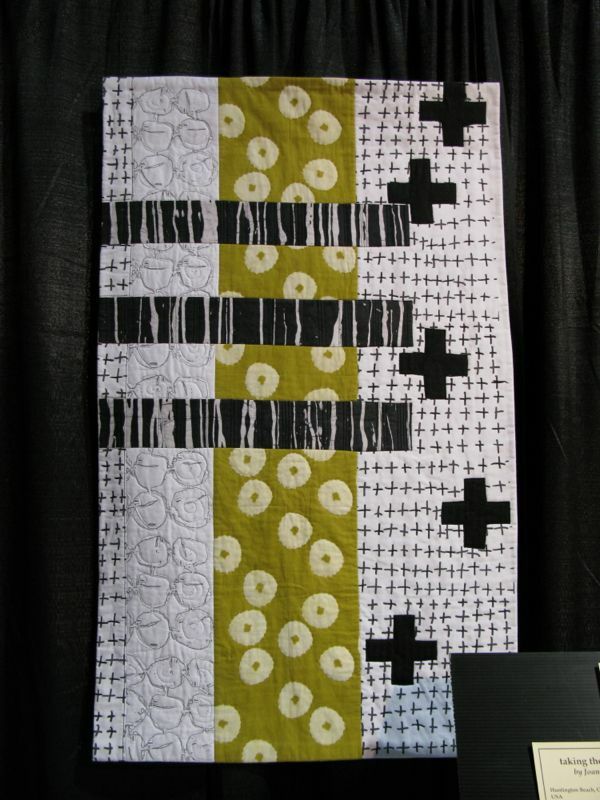 Thank you for sharing these quilts. 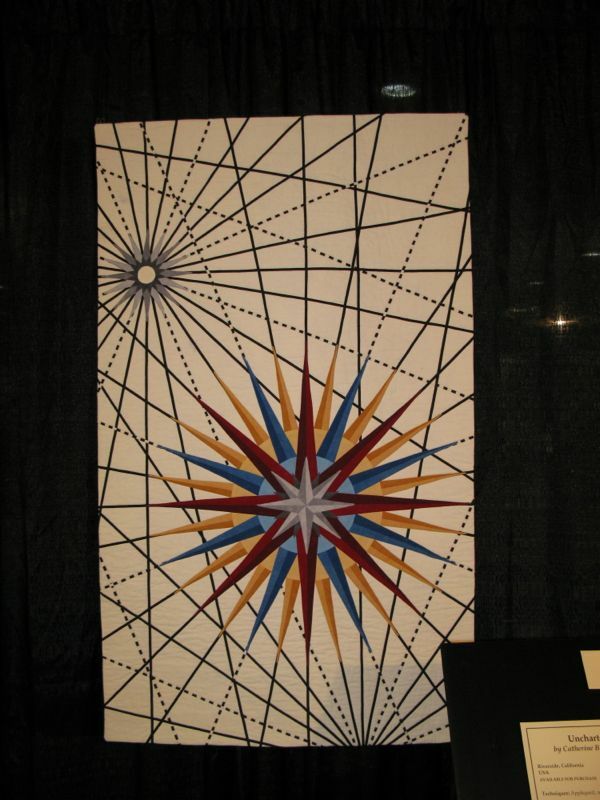 I have been thinking of all types of things I could design and how I would execute each of them. I have had some similar thoughts shown here, but with my own twist on them. Can’t wait to get started with the fabrics and media.